We did something totally out of character today. We actually left a plumbing showroom on speaking terms, without screaming at each other that "one of us has no taste, and it's not me", or without the despondent feeling that comes after looking at every faucet in the showroom and knowing you hate them all equally. We were so pleased with ourselves we rewarded us with lunch overlooking the water. And what had caused peace and serenity to envelop us in this manner? 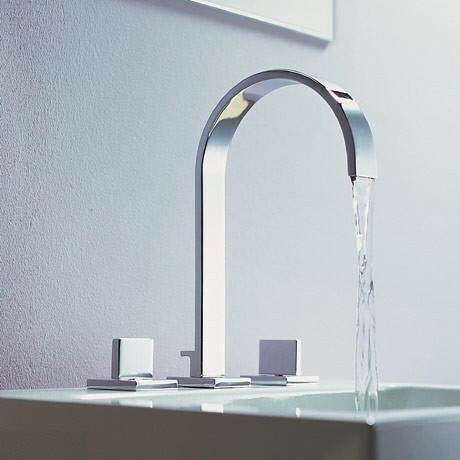 The stunningly simple but arrestingly beautiful MEM bathroom faucet from Dornbracht. We looked at it and simultaneously declared it THE ONE. It comes also as a waterfall bath spout, which will make it perfect for the master bath, as well as the large spread for the basins. The only teensy weensy little issue is that we seem to have set our hearts on the most expensive faucet in the store, and we'll need two sink faucets, the bath faucet and a shower system, which flies in the face of our philosophy and promise to do this renovation as economically as possible. Still, it's a small price to pay for marital harmony, no?